Ok, stop salivating or carb counting inside your head right now. 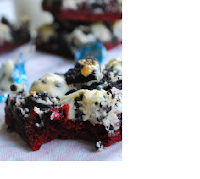 Regardless of anything you might be thinking as you read this post, despite the excuses you might be making right now, these brownies will be made and they will be made by you, mighty blog reader. And then they will be eaten, and the whole experience will be glorious. This is a fact. The brownies themselves were quick and simple to make, fun and different from your average baking recipe, and they were the most delicious brownies I have ever made or eaten. The entire pan of brownies is already gone, and it has only been a few hours, and while my stomach may be in great pain my mind is happy. But enough talk. On to the recipe! However, as I do not believe that it is right for me to copy shamelessly (as many do, unfortunately), I will just share this recipe rather than just re-write what has already been written. The blog that the Pinterest image redirected me to was http://thedomesticrebel.com, a great blog filled with oodles and oodles of great recipes, clear instructions, and overall good desserts. The recipe for the brownies can be found here, although I highly suggest keeping the blog in mind for future recipes (bookmark that stuff). Well, I guess when you compare the pictures I may have missed the mark by a tad (only just a tad), but they still tasted great and will definitely be made again. I hope you like the recipe, and be sure to comment what you think or share with friends! Thanks! Do all Canadian tenns write in such a funny way? Your postvwas fun to red and I bet the brownies were good, too. Ahh you are too kind :)but thanks and I'm glad you enjoyed reading the recipe! And the brownies were delicious indeed. I highly recommend them!